Whoever decided to start marketing cylinders of high-density foam to avid exercisers as the latest, greatest workout tool was a genius. Not only are these foam rollers just about the simplest invention to hit the gym since the resistance band, they happen to be one of the cheapest and most effective tools around. But if you have no idea how to foam roll, don't worry, you're not alone. Because foam rollers typically don't come with instructions printed on their sides, unless you've seen one in action, it's unlikely you'd instinctively know what to do with one. The good news is that, unlike the other torture devices you find at the gym, the foam roller actually provides the best kind of torture in the form of a (sometimes painful) self-massage. Like the tool itself, foam rolling is quite simple. All you have to do is sit or lie atop the roller so your body's weight presses down into the tool. 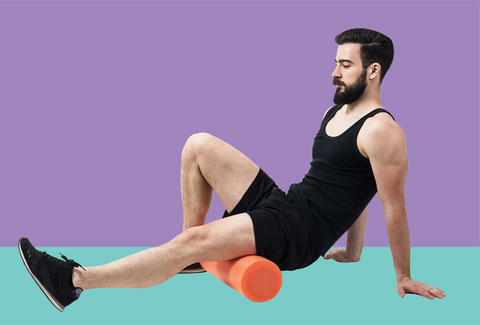 You then roll slowly across the roller, moving in the direction of the muscle group you're rolling, essentially using the roller to deliver a massage. This type of self-massage is termed "self-myofascial release," or SMR, and it's designed to help loosen adhesions that develop in your muscle fascia. Which leads to the inevitable question: What the hell is muscle fascia? It's essentially a collagenous web that wraps all your muscle fibers (and everything else in your body). This fascia can "lock up" when it's dehydrated or damaged, leading to adhesions more commonly thought of as knots in your muscles. Over time, these knots can contribute to chronic pain and injuries, as well as limited range of motion. Fascial adhesions aren't your friend. Foam rolling is one way to loosen up adhesions by increasing blood and nutrient flow to the muscle fascia while simultaneously helping buffer away waste. And it works. According to a 2015 review of literature on SMR published in the American College of Sports Medicine's Current Sports Medicine Reports, "SMR appears to have a positive effect on range of motion and soreness/fatigue following exercise." So next time you're bemoaning your sore, tired body after a workout, but can't cough up the $50+ bucks for a trip to the masseuse, just spend $12 on a foam roller and roll away your pain. You can start with these four go-to exercises. Sit on the ground in front of the foam roller and lean back across the roller so it's positioned under your mid-back, perpendicular to your torso. Once you feel comfortable, press through your feet and lift your glutes off the ground so you're balanced on your feet and the roller. You may want to position your hands behind your head to support your neck and prevent neck strain. From this position, use your feet to pull your torso down as you roll over the top of the roller, enjoying a massage between your mid- and upper back. Once the roller reaches your upper back, just at the nape of your neck, reverse the movement and use your heels to push your torso away as you roll over the top of the roller until it reaches your mid-back. Continue rolling up and down for a total of about 10 to 12 passes. Sit on top of the foam roller with your knees bent, your feet flat on the ground. Lean your torso back slightly and place your palms on the ground behind the roller for balance. Cross your right ankle over your left thigh, then shift your weight to the right so you're sitting on your right glute, your left glute lifted off the roller. From this position, use your palms and feet to help you roll up and down over the roller, massaging your right glute. Move slowly, and if you find a knot, stop and allow gravity to help loosen the tight spot. You can also shift your weight from side to side to target different areas of your glutes and hips. After about 10 to 12 passes on the right glute, switch legs and focus on the left glute. If you do a lot of running or cycling, the quadriceps roll is probably going to be painful, especially at first. Lie atop the foam roller so it's positioned perpendicular to your body across the middle of your thighs. Position your legs in a "neutral" position, your toes pointing straight behind you, your feet about hip-distance apart. Keep your abs engaged, and support yourself with your forearms, almost as if you're in a plank position, but with your feet off the ground. Use your core and forearms to draw your torso forward as the foam roller rolls down your quads, then backward as the foam roller rolls up your quads. Keep the massage between your hips and your knees -- don't ever roll directly over a major joint. After about 10 passes, spread your legs wider and point your toes outward to target the muscles at a slightly different angle, along the inside of your quads. After 10 more passes, draw your legs together and turn your toes inward to target the outside of your quads more effectively. Perform 10 more passes. Calves are often used and abused with little reprieve. Foam rolling is a great way to help ease tightness that can lead to foot and knee pain. Sit on the ground, your right leg extended, your left knee bent, your foot flat on the ground. Position the foam roller under your right calf, perpendicular to your leg. Lean back slightly and place your palms on the ground behind you. Use your palms and your left foot to press down as you lift your hips from the ground. From this position, use your core, hands, and heel to help draw your torso forward and backward as you roll your right calf slowly over the foam roller. Do about 10 passes with your foot straight, then 10 with your toes pointed out and 10 with your toes pointed in. After all 30 passes, switch legs and repeat. Laura Williams is an exercise physiologist and fitness writer who takes a foam roller everywhere she goes. Not even an exaggeration. Connect on Twitter @girlsgonesporty.